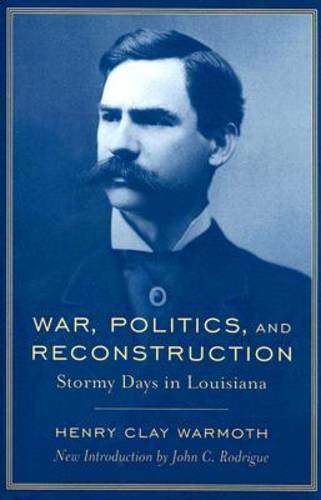 A memoir of the ambitious life and controversial political career of Louisiana governor Henry Clay Warmoth (1842-1931), ""War, Politics, and Reconstruction"" is a firsthand account of the political and social machinations of Civil War America and the war's aftermath in one of the most volatile states of the defeated Confederacy. An Illinois native, Warmoth arrived in Louisiana in 1864 as part of the federal occupation forces. Upon leaving military service in 1865, he established a legal practice in New Orleans. Taking full advantage of the chaotic times, Warmoth rapidly amassed fortune and influence, and soon emerged as a leader of the state's Republican Party and, in 1868, was elected governor. Amid an administration rife with scandal, the Louisiana Republican Party broke into warring factions. Warmoth survived an impeachment attempt in 1872, but a second attempt in 1873 culminated with his removal from office. This fall from Republican grace stemmed from his allegiance with white conservatives, remnants of the old guard, and staunch opponents of those Republicans who sought a wider political role for African Americans. Never again to hold political office, Warmoth remained in his adopted Louisiana, enjoying the fruits of his investments in plantations and sugar refineries. In 1930, the year before his death, he published ""War, Politics, and Reconstruction"", a vindication of his public life and a rebuttal of his carpetbagger reputation. Despite Warmoth's obvious self-serving biases, the volume offers unparalleled personal insights into the inner workings of Reconstruction government in Louisiana in the words of one of its key architects. A new introduction by John C. Rodrigue places Warmoth's memoir within the broader context of evolving perceptions and historiography of Reconstruction. Rodrigue also offers readers a more balanced portrait of Warmoth by providing supplemental information omitted or slighted by the author in his efforts to cast his actions in the most positive light.